Have contributed a story to this fantastic collection of speculative fiction stories (and graphic short stories), Eat the Sky, Drink the Ocean. Rarely has such good energy and such fun been had by so many in the putting together of a single book. 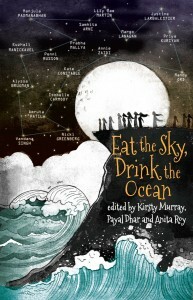 Fantastic cover by Allen & Unwin’s in-house designer, featuring all the contributors’ names in a glittering constellation – and Priya Kuriyan’s wonderful artwork. Out in October 2014 in India with Young Zubaan, and publishing in Australia in early 2015 with Allen & Unwin. Will keep you posted!